Listen to "Heir of Novron" on your iOS and Android device. 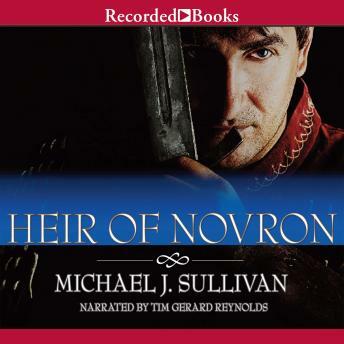 A rising star in the fantasy genre, Michael J. Sullivan has built an ardent following for his Riyria Revelations saga, which draws to its epic conclusion in Heir of Novron. On the holiday of Wintertide, the New Empire plans to burn the Witch of Melengar and force the Empress into a marriage of their own design. But they didn't account for Royce and Hadrian finally locating the Heir of Novron-or the pair's desire to wreak havoc on the New Empire's carefully crafted scheme. A little cliché/cheesy but great fun throughout this series despite it feeling like a lotr movie directed by micheal bay at times. It was a good end to the series! I enjoyed it very much. Great finale to the series. It kept me wishing my commute was longer so I could hear more. The narration was excellent, it really put you in the story.